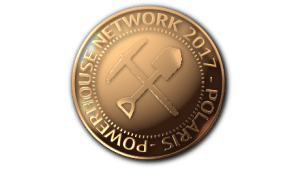 I have been talking a bit about the Powerhouse Network for some time and made a small investment into it which is growing nicely. I currently have 2000 or so Polaris tokens which are about to be tradeable on the Etherium network today. I also have an investment in their “Trading Tree” and some of their mining. What is different about Powerhouse is the founders and people running it – Darren Bradbury and his cohorts are actually available for chat on the internet and make no secret of who they are. This gives me confidence because unlike other organisations who hide behind a flash website (and trust me, the Powerhouse website is far from flash, it’s design really could do with an update, but saying that it’s VERY simple and plain, not the typical scam website at all), they carry a level of integrity and honesty that I like. When they make mistakes (which they have), they own up and are truthful about them, frankly, I’m glad I got in at the very start. Although other members seem to be religious about the organisation in their fervour (I find it hard to be because 99% of what I review is a scam), I think their fervour may actually be only half of what Powerhouse is actually worth. I have already covered my small investment and am very interested to see what happens when Powerhouse Polaris token goes live on an exchange, at that point, when it becomes tradeable it will have an intrinsic value and actually could be exchanged for Bitcoin or another Crytpo which then could be sold for cash! The trading tree is a unique opportunity for anybody to create an increasingly growing stream of income leveraging a lucrative trading operation that has been creating profits for 4+ years. Making consistent money from being part of the trading tree is possible by only buying at least one full position of $25. $20 from that amount is sent to the trading side while $5 goes to the position in the tree. After buying at least 1 position, the members open themselves to two hugely lucrative streams of incomes merged in one powerful system: The tree, and the trading. The tree is the pay structure of the business. There are three levels and the only entry is through level 1. Each level is a 2×3 matrix. This means that each one of these matrices only needs 14 positions to be filled before it is completed. These positions can be filled by referred members or from spill overs. 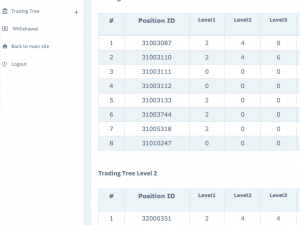 A position in the level 1 matrix costs $5, and it is paid from the initial $25 cost of a full position in the trading tree. Once placed in this matrix, each position filled under the member, from either referrals or spill overs, pays $0.8. This means that once the 14 required positions are filled, the total payout from the first matrix is $11.2. Upon completion of the level 1 matrix, 3 first level positions are purchased on behalf of the member, in addition to a position in level 2. A position in the level 2 matrix costs $10, and it is purchased automatically after completion of the level 1 matrix. Once placed in this matrix, each position filled under the member pays $1.6. Once the 14 required positions are filled, the total payout from the second matrix is $22.4. Upon completion of the level 2 matrix, 6 first level positions are automatically purchased, in addition to a position in level 3. A position in the level 3 matrix costs $20, and it is bought on behalf of the member automatically after completion of the level 2 matrix. Once in this matrix, each position filled under the member pays $4. Once the 14 positions are filled, the total payout from the third and final matrix is $56. Upon completion of the level 3 matrix, 16 first level positions are automatically purchased. This pay structure insures that any initial investment in a position opens up a serious stream of income through all the positions that are being purchased after completing the matrices, increasingly growing the income with time. But what makes this pay structure truly efficient in the trading tree is the engine that is driving it forward: The trading operation. $20 from the initial $25 invested on each full position in the trading tree goes to the trading operation run by the Powerhouse Network. The trading side pays the member daily returns that fluctuate between 0.5% and 1% every day for 730 days. This makes the return on the investment between 365% and 730% in two years. For each $25 full position, the return in two years is between $73 and $146. All the payouts from both the tree side and the trading side go straight to the balance of the member. Any amount in the member’s balance is subject to the 60/40 repurchase rule. 60% of the balance is used to automatically buy more $25 full positions in the trading tree, which will exponentially increase the size of the account, thus consistently increasing the payouts cashed out by the member. And sky is the limit! All the profits mentioned above are for members who will simply invest in the full positions and relax. On the other hand, those who have great communication skills or marketing knowledge can increase their profits from the trading tree exponentially by referring people to this incredible business opportunity. Each member is entitled to an amazing 25% matching bonus on every referral. This means that you will get straight into your balance 25% of whatever your referrals make as profits in the trading tree. Combine this with how sustainable & self-sufficient the trading tree actually is we can safely assume that the incentive is clearly there; so if you are a marketer, take advantage! With that said, the trading tree is a financial freedom machine fueled by the power of trading and designed for everyday people. It is completely self-sustainable and buying the $25 full position is all what members need to do in order to create an ever-growing stream of income for themselves and their families. We are very happy to have you on board!